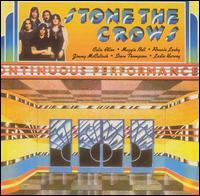 Stone The Crows were signed by Led Zeppelin guru Peter Grant in 1969 with former John Mayall drummer, Colin Allen, joining vocalist Maggie Bell, Jimmy Dewar (bass) and Les Harvey (guitar). On 3 May 1972, Leslie Harvey died after being electrocuted onstage at Swansea's Top Rank Ballroom. Although the group completed this fourth album with Jimmy McCulloch from Thunderclap Newman, the tragedy effectively curtailed the band's activities and they broke up the following year.